My wife and I have lived in Leslieville since 2001. We’ve seen the neighbourhood evolve and restaurants come and go. We’ve eaten pretty much everywhere. This post is to save you the hassle. Best Coffee: Mercury. It was the first high end coffee place to open and remains the best. Best Breakfast Sandwich: The Winter Warmer with a fried egg at Rashers. It’s all made fresh and the Sriracha gives it an amazing kick. Best Breakfast: Is at Jim’s. Keep it simple and go for the basic fry-up. The Leslieville Diner is also a good bet. Best Brunch: There is always a line at Lady Marmalade. We’re never really sure why. We much prefer the brunch at Lil’ Baci. The Eggs Benedetto is really good. Best Lunch Sandwich: Brick Bakery makes the best tuna sandwich on the planet. Fresh bread and perfectly seasoned. Best Bakery: Also Brick. The cinnamon roll, the blueberry cheese turnover, and the sourdough. Best Ice Cream: Can’t go wrong with Ed’s Real Scoop. Best Pizza: If you’re after traditional, cheesy, comfort food for movie night its Danforth Pizza House (get extra cheese). If you’re after a big, classic Italian pie go to Tommaso’s. And if you want hipster goodness go to North of Brooklyn. The delivery options are generally all poor. Best Burger: I have to go with Great Burger Kitchen. The burgers are big, very well spiced, and made with fresh ingredients. Best Chicken: Best roast chicken is at George’s Deli & BBQ at Sherbourne & Dundas. Best fried chicken is at Chick-N-Joy. Absolutely perfect. Best Greek: Best kebobs are at Astoria. Best pastries are at Athens. Best Vietnamese: It’s Pho House. Trust us. We eat here twice a week. My daughter’s favourite food in the world. Best Indian: Is Makkah. The butter chicken has a smoky note to it. The samosas are amazing. But the best is the chili chicken. Best Chinese: Kaka Lucky Seafood BBQ. Eat anything with the pork in it. Best Thai: The original Sukhothai location on Parliament. Best Date Night: It’s at Goods & Provisions. Run by a local couple, service is impeccable, cosy atmosphere, and amazing food. A true treasure. The Memorial to the Murdered Jews of Europe remains one of my favourite (if that word can be applied to such a thing) parts of Berlin. I find it particularly powerful. This directly contrasts with the experience of most everyone else, who can be placed in two groups. The first are the puzzled tourists who mutter “This is it?” to each other. The second are the classicists who see it as insultingly inadequate, painfully vague, or, at best, underwhelming. It is, without question, non-traditional. It doesn’t have any of the architectural trappings usually associated with memorials. It’s relative blandness is made even more stark by its proximity to the Brandenburg Gate. But to focus on its physical appearance is to miss the point. It is an experiential memorial that provides the participant with the briefest (and, by limits of representation, inadequate) glimpse into what it might have been like to be near or involved in the actual event. First and most importantly, there is the obvious symbolism of the stacked coffins – that you are surrounded and overpowered by death. But that’s just the beginning. You don’t know what it is. Walking by, you can’t help but notice it, but there are no signs explaining it or indicating its importance. It’s just there, defying explanation. People disappear into it. If you stand across the street and watch, you’ll see groups of people slowly sink from view as they walk between the pillars. They don’t reemerge. Its true scale and depth are imperceptible, till you’re already consumed within it. The pillars in the middle stand 12 to 15 feet high. You don’t realize how ‘tall’ the coffins are stacked when you’re on the outside looking in. Similarly, you can’t tell how many people are inside it till you’re also inside. From the street it looks empty. Once inside, you realize there can be upwards of 100 people trapped in its maze. Enter and you quickly get separated from your group. Take one unexpected turn and you lose contact with your friends and family who entered just a few steps behind you. It takes considerable effort to find them again. Which means you’re on your own. Isolated. It’s you vs. the memorial. People flit in and out of view. As you walk through the memorial, other people quickly cross your path and disappear. Brief, fleeting glimpses of strangers you’ll never see again. The close confines force you into unexpected confrontations with strangers. You can easily run into people also trying to find their way through. And finally, despite the regimented layout, there are enough incongruencies – like the occasional leaning pillar threatening to fall over, or the undulating ground throwing you off your stride – to ensure you never gain total confidence. It is impossible to convey the scale, misery, and horror of the Holocaust. But I find the memorial significantly more evocative and moving for its lack of pretension. 2013 was a challenging but rewarding year. We moved from a development team of one to a full team of six. We took on rebuilding our small dollar program. And we played with models on how best to deliver our programming. It seems to have paid off. We have a solid team of new leaders hitting their stride, process gaps are getting filled, and all of Mozilla is getting more excited about the potential of fundraising to bring new resources and contributors to the mission. Most importantly: we hit our targets. We raised $10.5M in institutional funding and $1.5M in small dollar funding. I often say that fundraising is pass/fail. So, in this sense we passed. There are things that didn’t work. Our early explorations around major donors have largely fallen flat. That said, we’ve learned a lot and have a great sense of how to structure things differently going forward. The prevalence of privacy and surveillance as an issue, our emerging partnership with civil society organizations, and our growing policy program all provide an ideal opportunity to do something huge. I’m looking forward to helping make that happen. But the biggest challenge heading into 2014 stems from a new role. The communications and development teams have been combined into one engagement team. This larger and expanding team will be responsible for our new, unifying goal: engaging contributors. Mozilla is a movement. When we succeed, it’s due to the individuals who give their time and resources to the mission. As competition in the browser, phones, education, and privacy space heats up, our ability to compete and win is wholly dependent on getting more people involved. That objective will be my sole focus in 2014. Fortunately, we have an amazing group of people rallying to the call. The existing communications and development staff will be joined by new hires skilled in large-scale product marketing. We are beefing up our operational capacity by hiring a new program manager. And we are doubling down on major donors by hiring a new person to build that program. Hit targets. Success in 2014 is dependent on understanding how to plan for and achieve scale. This means an increased focus on metrics, conversion, and generally building a culture across our organization that cares about going big. Build a service framework. We lack support infrastructure around engagement activities such as web site development, copy writing, graphic design, press relations, donor management, list growth, etc. Our current systems are the result of incremental decisions made during our rapid growth. They’re the best talented people could make happen at the time. But our current position allows for a chance to reflect on that infrastructure and think of how to make it better. Empower new leadership. This is easily, and usually correctly, dismissed as HR tripe. But, in our case, this is make or break. There are people out there extremely skilled at what we need to do. We’ve been fortunate to have already found and hired a number of them. My job is to support people with the resources, models, and freedom to take ‘Mozilla’ and run with it. It all starts this week. It will be tiring, largely because the EOY campaign was very stressful and I haven’t had a chance to take a break. That comes in February. But the extravert in me loves the energy of work weeks. And I’m deeply love with the team we’ve built. Earlier in the spring, we ran a donations campaign providing a ‘last chance’ to receive a Mozilla dino plushie. We were recently notified by the manufacturer of a small issue in the production, which I wanted to explain here. 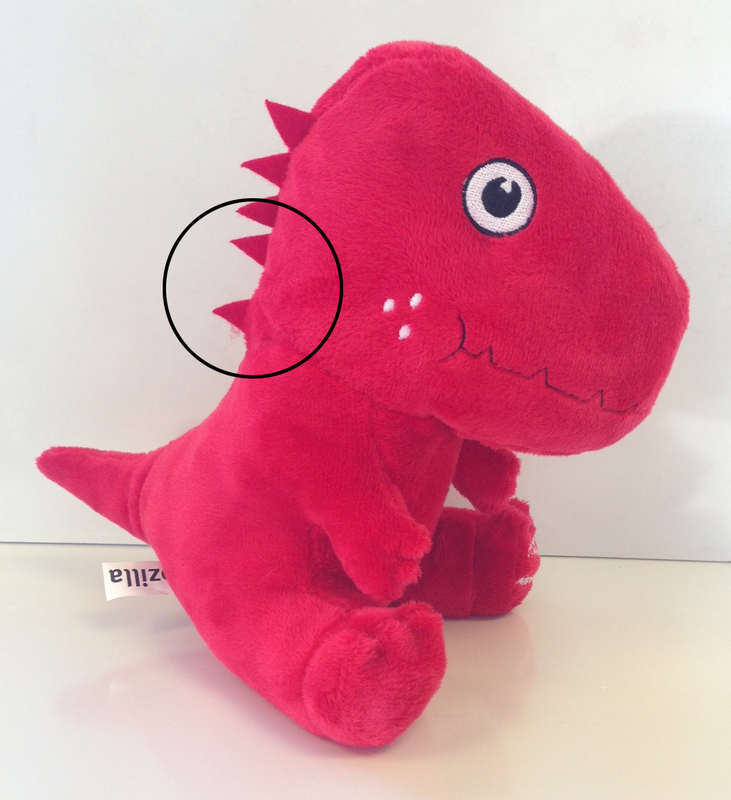 Due to the positioning of the seam between the neck and the body, the last ‘fin’ on the dino is lower than in the original design. See the photo below. Condemning 2,000+ plushies into landfill is not a good idea. We were able to negotiate a 50% discount from the supplier, which means more of your donation will be going to serve the Mozilla mission. I hope you’ll agree that this was the right call and continue to give your dino all the love it deserves when it arrives. And on that note, the last of the dinos will ship Wednesday, June 26, 2013. The manufacturing issue caused a delay beyond the original schedule of 10 weeks, for which I apologize. The anniversary campaign was one of our most successful ever and I’m hugely grateful for everyone’s support. If you have any remaining questions or concerns, you can e-mail donate@mozilla.org or reach me directly on Twitter at @taliesan. Update on the Update: People have started to receive them! A number landed last week and over the weekend. Dino love showing up on Twitter. After years of resistance, finally making the leap into blogging. Hope to use it as a way of exploring some of the idea, concepts, and recurring themes that underlie my work with the Mozilla Foundation.